In Size DOES Matter, you have to increase the height of a cube to match the size of the gates that come one after the other from the right. 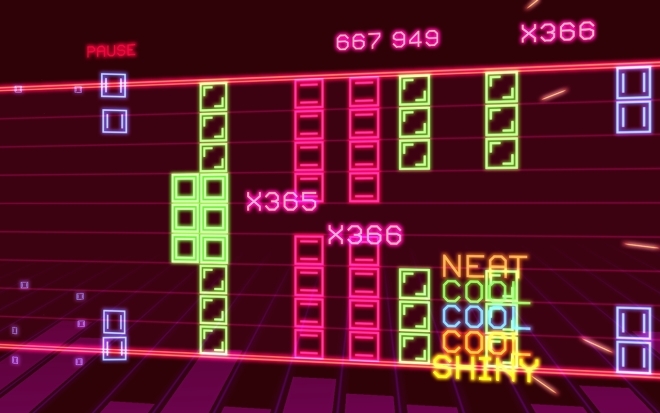 The game is rhythm-based, so they gates appear on the beats of the music but that doesn’t really matter too much. You have two controls at your disposal. Swiping vertically on the right side of the screen increases the size of the cube from one block to three and finally five. On the left you have to swipe up and down to move the block vertically. As the gates appear from the right, you have to move the block to position it so it passes neatly between the gate. You also have to increase or decrease the size of the block so that it matches the size of the gate. It can neither be bigger nor smaller than the gap in the gate. This is basically the game. Depending upon the level you’re playing, the gates either appear at a relaxed or breakneck pace and you usually have a split-second to move the block and then adjust its size. At times the signals get crossed and you end up changing the size instead of moving the block or vice-versa. You get three chances at the beginning of each level. If at least one is remaining at the end of the first stage of the level, you move on to the next stage. If you exhaust all three chances, the game doesn’t end immediately but it ends at the end of that stage. Depending upon how well you do you score and if you keep going without hitting something or breaking your combo you get a multiplier that exponentially increases your score. You need that score if you want to unlock the next level. Playing and unlocking initial levels is easy enough but later on the game gets too fast to play without throwing the phone out the window. Unless you have superhuman reflexes and timing it is pretty difficult to control the game and unlock future levels. With practice you do get better at it but after a time it is easy to hit a wall and then just give up. This game would best be enjoyed by people who play games like Super Hexagon because you need that level of precision to get far in this game. It’s not to say others can’t enjoy this game but then they’ll probably not play long enough before giving up. Size DOES Matter does look quite nice. 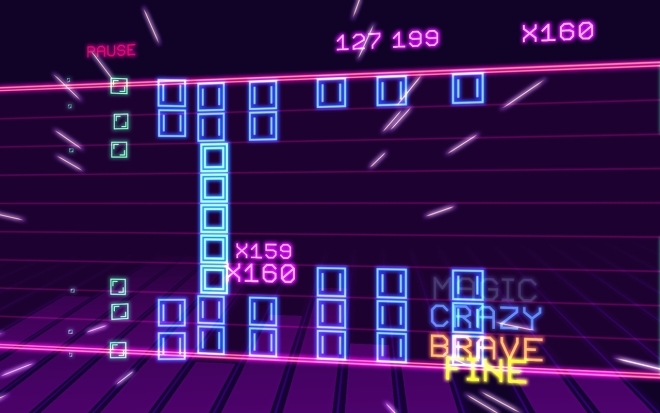 The game has a very psychedelic appearance with neon colors and pulsating animations. The star of the show, however, is the music. The game includes some quality EDM track from a handful of DJs, some of whom you may have heard providing music for other games out there. The music really is great and if you’re into the EDM genre it’s worth buying the game just for the music alone. 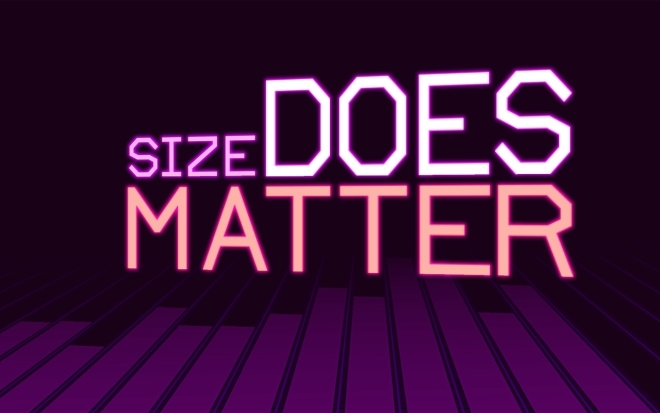 Size DOES Matter is a pretty fun game as long as you can keep up with it. Problem is, you can’t really keep up with it for too long and then it’s easy to just let go than to try harder. 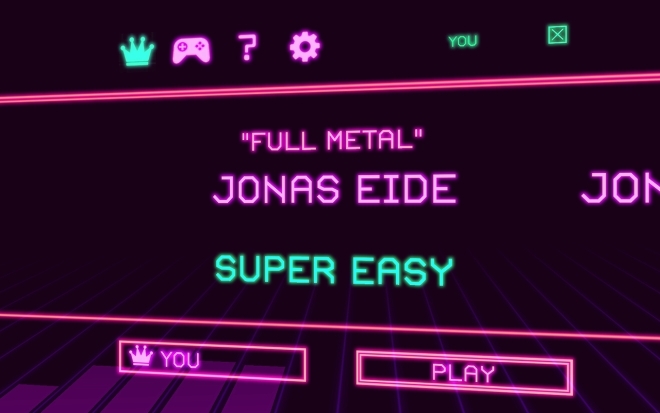 The difficulty in later levels is a bit unforgiving and not something most people can handle. The game does look nice though and the music is great. At just $1, I think it’s well worth the price.